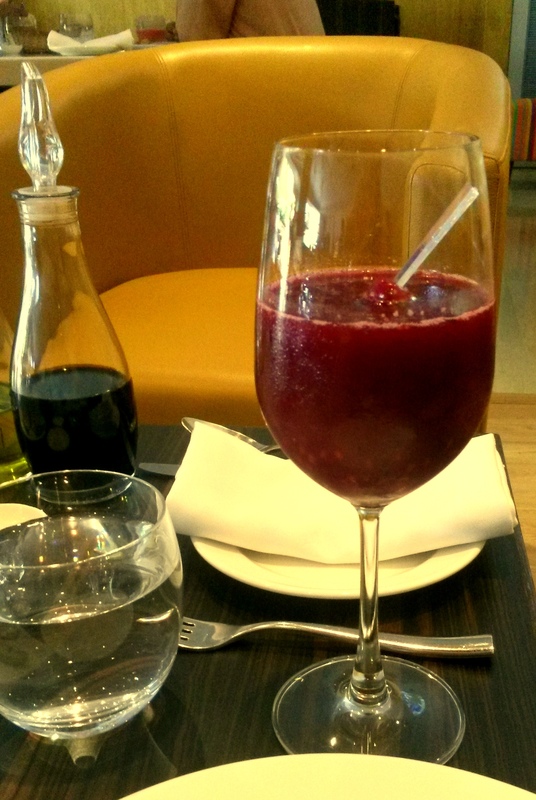 The news of the shutting of Otto Infinito the Mediterranean restaurant in the corporate hub of Bandra Kurla Complex (BKC) was little saddening as the restaurant seemed to be doing well on a few of my visits, once during the Sunday brunch. Nonetheless I assume the management must have given a thorough thought to the decision and now has come up with Café Infinito an all day diner in its place. 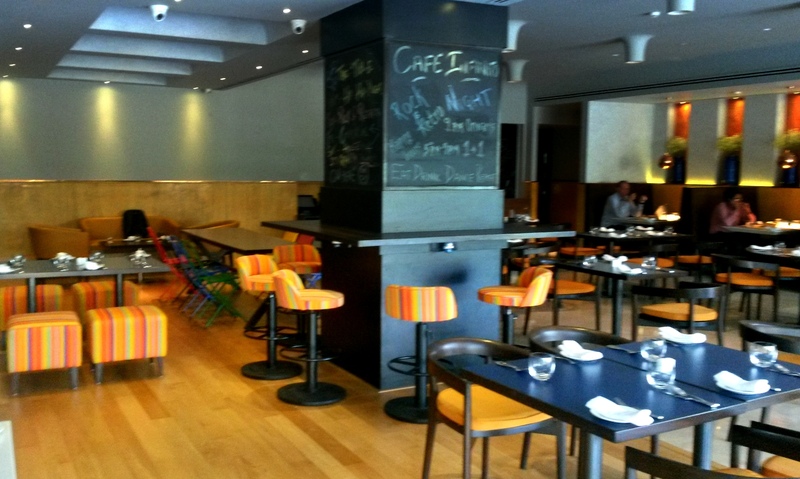 Cafe Infinito still in its first month of operations with a layout pretty much the same as its predecessor. A welcome change is the vibe of the place with a formal cream and brown furniture giving way to more vibrant colours and a major addition and possibly an attraction for many is the bar. What more is a DJ playing in the later part of the evening with every night being a different genre. 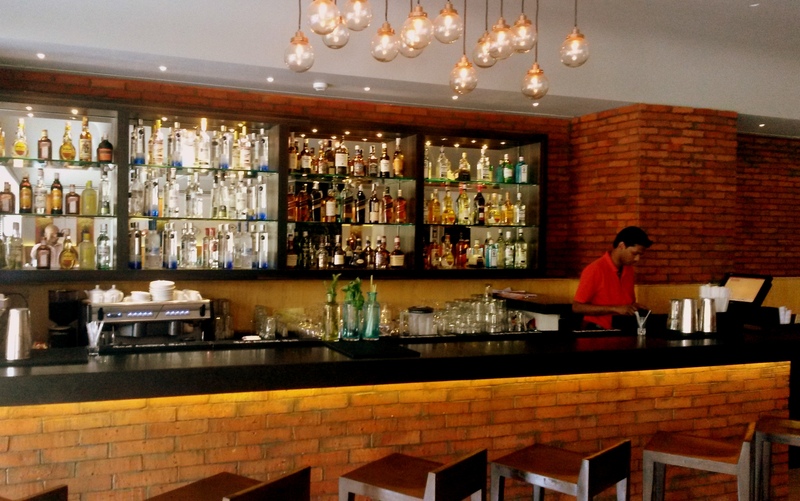 The bar is fully stocked with a fair collection of wines, spirits and beer. 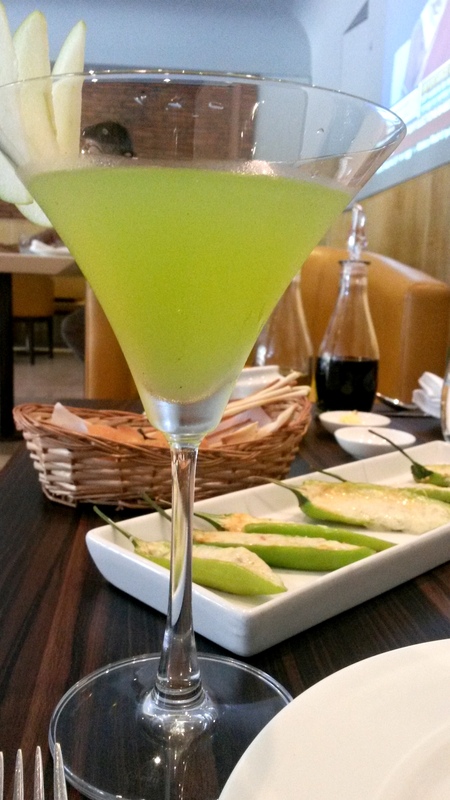 We ordered a Basilico Smith Martini (Rs 275), a Berry Sangria (Rs 475) and a Mozzarella and Parmesan stuffed Chilli nibble (Rs 175) and to begin with. The Martini was refreshing but the Sangria was a little too sweet but bursting with berries while beholding its winey taste. The chillis were delightful drawing salt from the cheese, the scent from the lemon rind and the spice from the chilli. It is a must try! 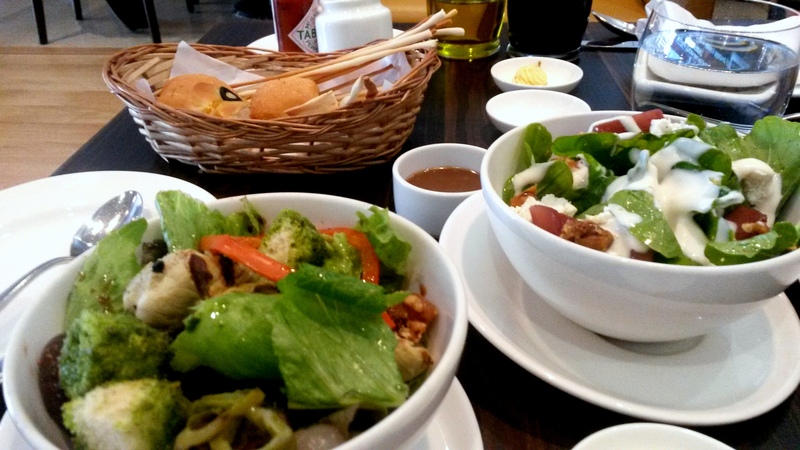 Leafy Greens, braised figs, artichokes, pickled onions and grana shavings (Rs 255): The crunch of the leaf, the sweetness of the dried figs, the earthiness of the artichokes, the prickly grana shavings and the surprise sweet bits of nougat thrown in made the salad such an ethereal combination. Arugula, Goat cheese, red wine poached pear and balsamic (Rs 290): My favourite leaves, the spicy Arugula, the salty and sharp goat cheese, the plump pear and the mouth watering balsamic dressing with pesto doused croutons made this salad a good choice again. 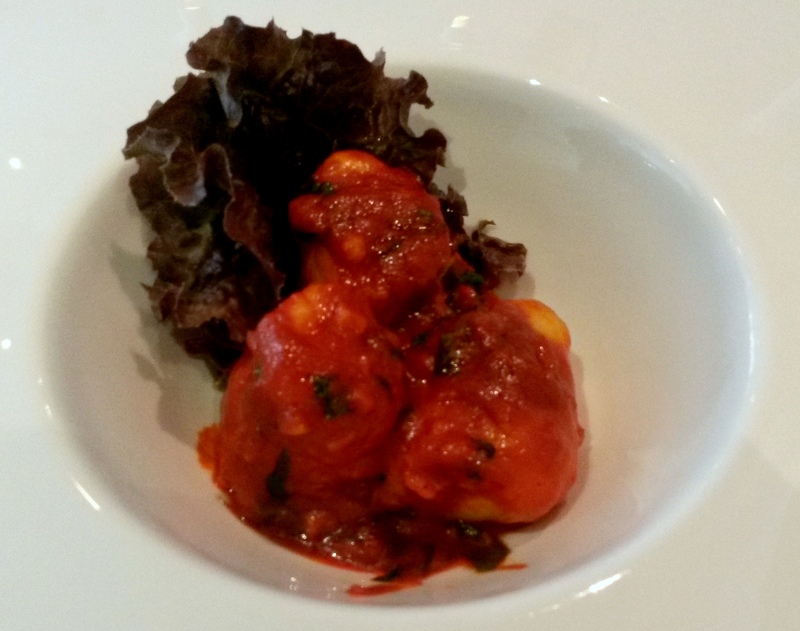 Gnocchi with Harissa fondue (Rs 275): The gnocchi was perfectly cooked with the Harissa being prominent in a tomato base. It was four pieces of gnocchi. Would love to pay a little less for this. 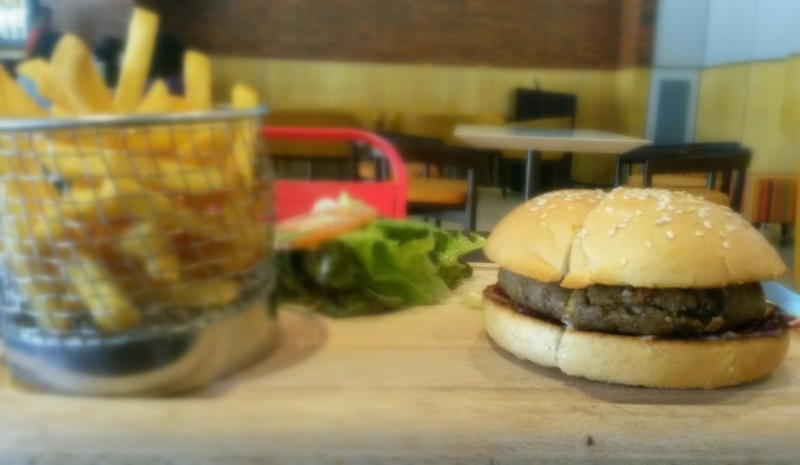 Soya, barley and crack wheat burger (Rs 320): There is only so much you can do to a veggie burger and hence I skip it always. This one alongside the Portobello mushroom variant caught my eye because of the patty. The burger was good but not a phenomenal difference that I spotted; maybe I must chuck the buns and taste the patty by itself on my next. You take a call here! 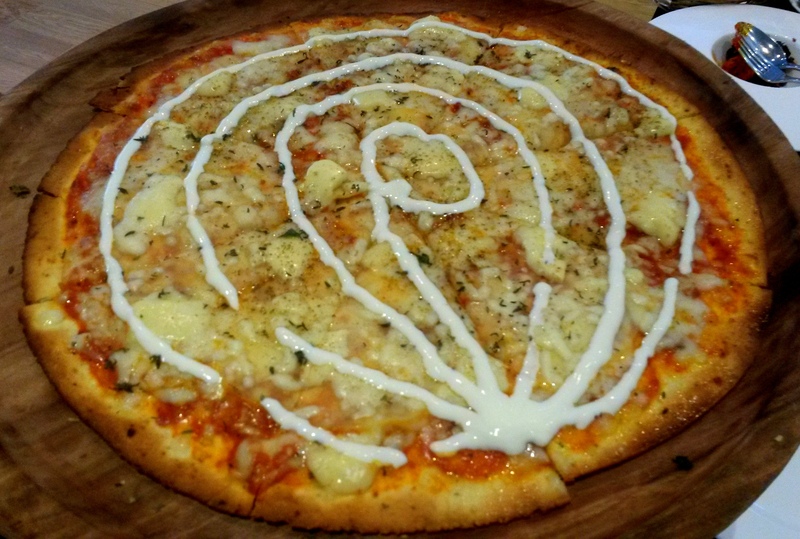 Garniture Pizza (Rs 525): Potatoes on my pizza for the first time. A splendid thin crust with simple yet powerful toppings of brie and sour cream, this pizza will make you think of it as you eat. 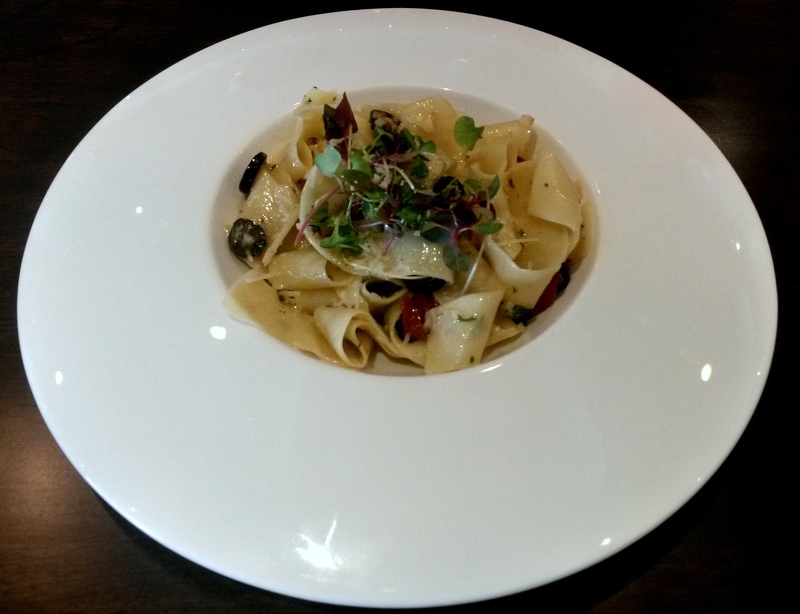 A classic served al dente with olives and pinenuts. 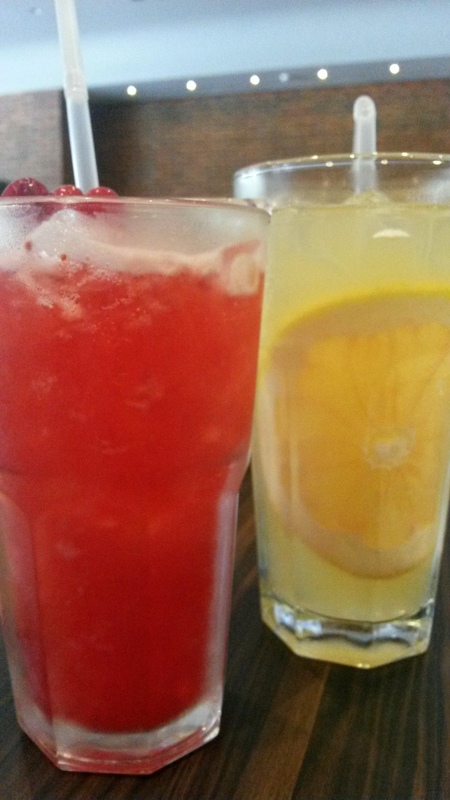 We kept washing down every course and got ready for more with some cooling iced teas, grapefruit and jasmine (Rs 225) was perfumed with bitter undertones from the fresh grapefruit and the Cranberry, Raspberry and Earl Grey (Rs 225) was completely masked by Raspberry with no taste of Earl Grey. 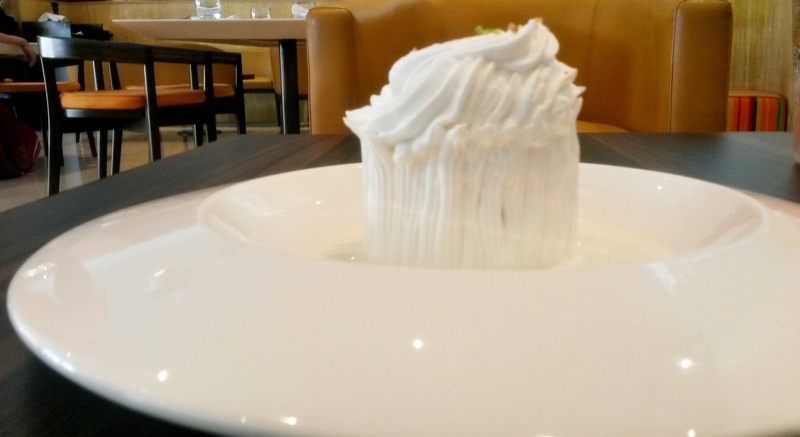 We finally settled for a classic dessert the Tres Leches (Rs 225) though I am not a great fan of the most commonly used whipped cream,feel it lacks flavour and also it has no dairy but vegetable fat. The dessert a rich sponge cake soaked in vanilla milk and completely dressed in cream was very pleasant, the sponge was great and the milk was chilled. Enough of whipped cream bashing now! Verdict: This place has a real fresh and lively daylit ambience, great food and reasonable pricing. Cannot be missed! P.S: Happy hours every day from 1700-2100 hrs and yes they deliver food in the ‘hood!